The ispot® is the most advanced LED floodlight on the market, with an attractive ultra thin design and innovative high voltage LED chips. The Brackenheath spot R range brings the same high-quality design and engineering to a round form factor. The R series is therefore ideal where a circular beam of light is required in a floodlight. You will find the spot R used to illuminate billboards, signage, stairwells (it can also be used inside) and to provide decorative and thoroughfare lighting. 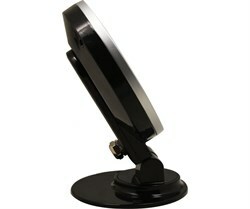 This model - the spot R 10W in Black- is the lowest wattage product in the range. 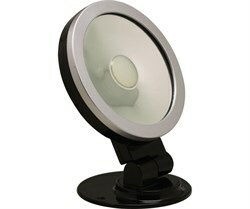 It provides a 120 degree beam angle and a 750 lumen output in a daylight colour temperature. 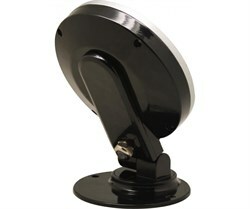 The product includes a unique mounting bracket that enables the floodlight to be orientated around 360 degrees - so you can get exactly the light direction you need. Once in place, the cable tucks neatly out of sight directly in to the rear of the product. It has a rated life of 36,000 hours, possible due to the innovative high voltage driverless LED chips and heat sink for enhanced heat dissipation. LED floodlights are up to 90% more energy efficient that halogen versions - and so can reduce your electricity bills significantly. The ispot R has a high grade aluminium body and attractive silver bezel. 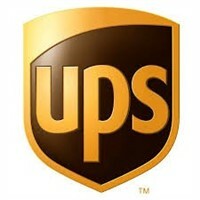 All parts are designed to be tough enough to withstand vandals and are rated to IP65. If you would like to mount the ispot R on the ground then the Brackenheath ispot Universal Spike in Small is recommended. Round LED floodlight, mounting bracket and 900mm flex. W x D x H: 133 x 176 x 50mm. Brackenheath 10W Ultra slim, high quality LED IP65 outdoor floodlight. Available in Warm or Cool white, redefines exterior lighting for your home, office and commercial premises. 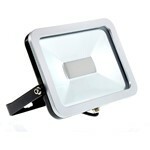 Brackenheath 10W Ultra-slim, LED IP65 outdoor floodlight. Redefines exterior lighting for your home and office. Ultra slim, high quality LED outdoor IP65 floodlight. Available in Warm White (3000K) and Daylight (5700K). Ultra slim, high quality LED outdoor IP65 floodlight. Available in warm or cool white versions. The ispot® is the most advanced LED floodlight on the market, with an attractive ultra thin design and innovative high voltage LED chips. ispot® RGB provides colour changing with 13 different colours.